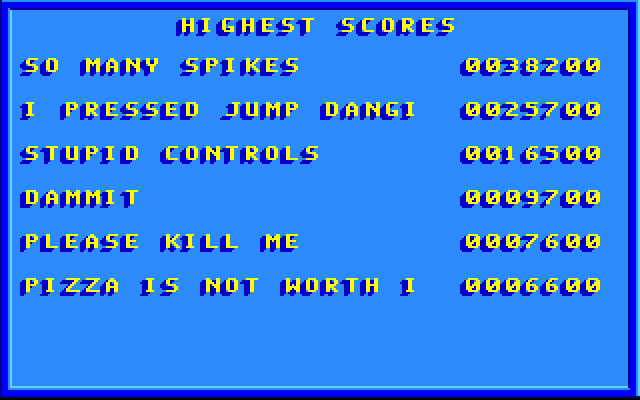 I haven’t had much luck today, two DOS games I tried to play didn’t work out. 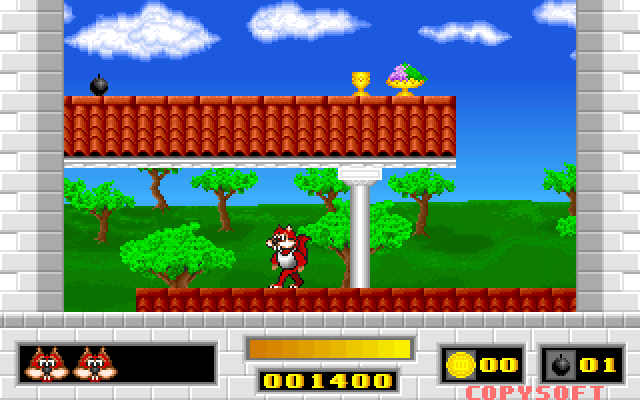 Firstly I tried the shareware Super Frog by Team 17 and found it to be way too short and lacking for a full post. Then I downloaded Gob Man, a Pac-man clone that is supposed to be pretty good. Unfortunately every time I move up the screen I got this weird corruption, seems some of the sprites are broken. 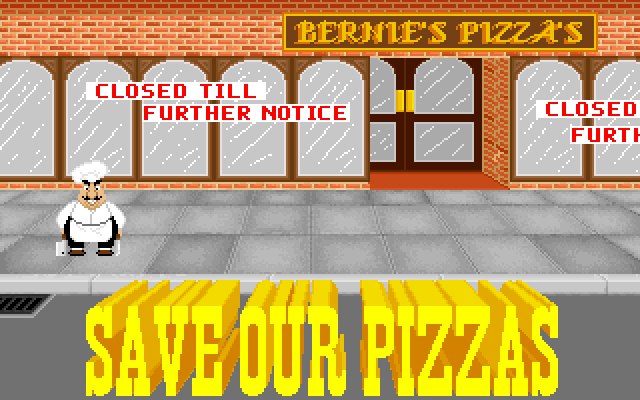 You could argue that my luck hasn’t improved when Skunny: Save our Pizzas did work for me. It was made by Copysoft back in 1993, around the same time as the two other games I’ve already looked at, Lost in Space and Back to the Forrest. They are all infamously bad in one way or another, so whilst I hadn’t played this one before I had low expectations before beginning. 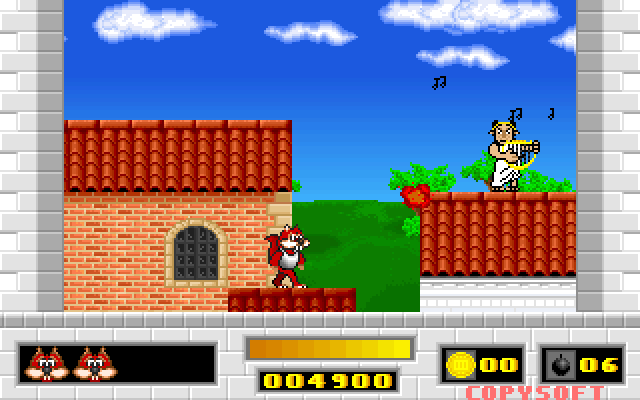 The story is a bit strange, much like the other games, here the evil “CHEF of CADIZ” has brainwashed all of the pizza chefs in Italy so that no-one knows how to make pizza. Presumably he did this to sell his food which is made of old shoes and plastic vegetables. So to solve this the Italian government called in Skunny Hardnut to travel back in time to retrieve the recipe. 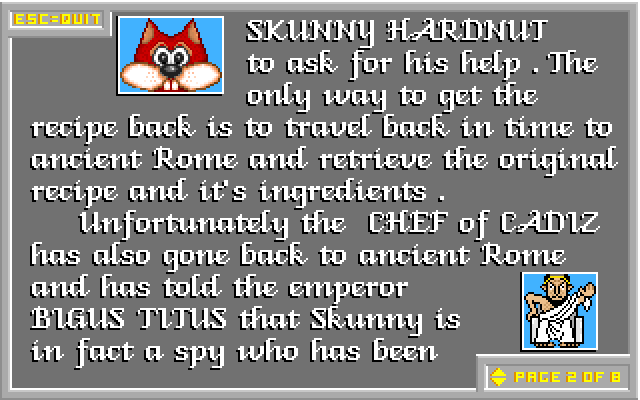 The Chef travels back as well and convinces the Roman emperor, named Bigus Titus, that Skunny is a spy coming to assassinate him. It’s certainly a nutty story to match the nutty character! I was also surprised they used the Roman name joke that used to turn up in more adult humour. Especially considering they aimed their games at kids. Like the other games the art is kinda middle of the road, better than the other games in some ways but still lacking in animation frames. The game engine does seem to perform ok on a 386 rough equivalent, so no performance issues like in Back to the Forrest. Audio again is fairly similar to the other games, with one annoying music loop that will repeat during gameplay until you hear nothing else but that maddening tune. The sound effects are ok, except for the death screams of the enemies. The PC speaker noises aren’t too bad comparatively, but still you might want to turn the sound off. Game-play wise there is the germ of a good game somewhere in there as the enemies and level design actually seem quite reasonable, well as far as I experienced anyway, as the controls and Skunny’s movement are so bad I could not complete the first level before filling the high score table and giving up. So what’s wrong with the controls? They feel jerky, jumping being the biggest problem. 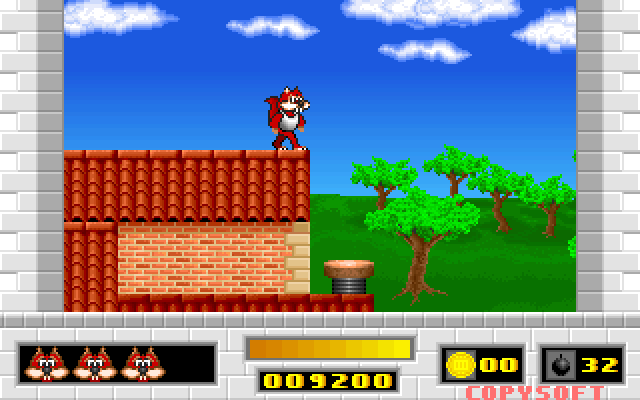 Sometimes the jump button doesn’t register at all and you fall off a ledge, other times you find that you over shoot a platform because Skunny does not drop straight down when falling. You have to wiggle back and forth to try and land in a particular spot. Also when Skunny takes a hit he’ll fly half way across the screen. This can also happen when you attempt to jump on an enemies head to kill them. Often you’ll land on spikes or fall off the level entirely just from one hit. Combined with the bad jumping mechanic and slightly dodgy collision detection you end up with a very frustrating and unfair feeling experience. 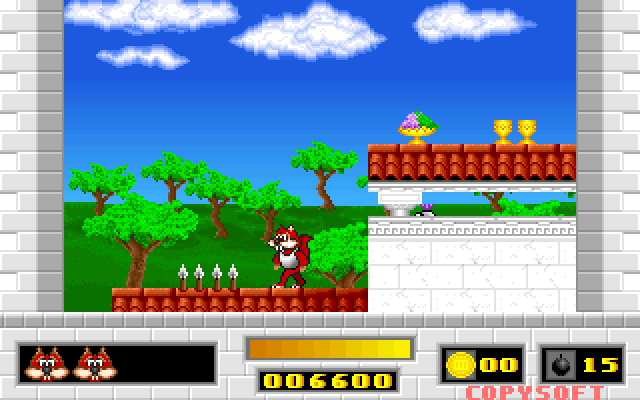 This particular entry in the Skunny series of games could have been good (well at least playable) if only a bit more polish was put in before release. 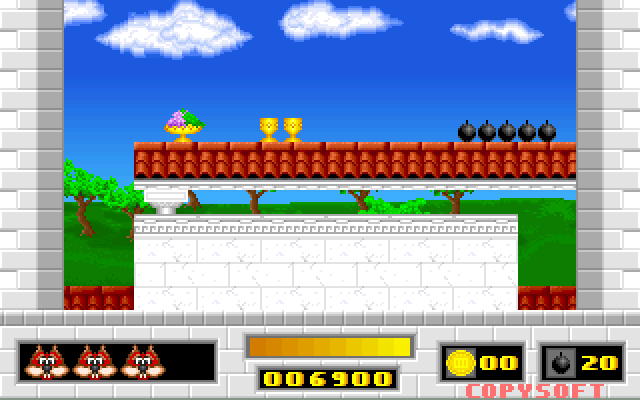 The controls, collision detection and Skunny’s movement mechanic in particular needed re-working as they make movement around a level much more difficult than necessary. Other aspects of the game aren’t perfect, but don’t impact it anywhere near as much. There’s nothing really to recommend it, unless you want to bask in its awfulness.